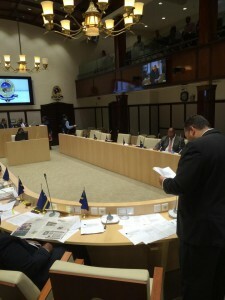 WILLEMSTAD - Next week Thursday, August 13th, the Parliament of Curaçao will talk about the controversial report of Ombudsman Alba Martijn about the functioning of the Minister Plenipotentiary in The Hague, Marvelyne Wiels. The MPs will debate with Prime Minister Ivar Asjes, who is politically responsible for the Minister. The main conclusion of the report is that Wiells is guilty of non-ethical behavior. In the report the Ombudsman also makes a number of recommendations. One of those recommendations is to test Wiels’ ability to lead the Curaçao House adequately through a capacity and personality test. Also to help her develop her communication skills and to curb her aggression towards her subordinates and third parties. The Ombudsman also recommended to hire an external expert to restore order in the Curaçao House and put it back in the right direction.